In the Colour view, drag the H,S,V sliders left or right to adjust the colour. In the Opacity field, adjust the colour's alpha. In the HSV/RGB menu, you can switch between HSV and RGB sliders. Double-click on the current colour swatch. In the colour picking area, click to select a colour. Type in the HSV or RGB values in the corresponding fields. 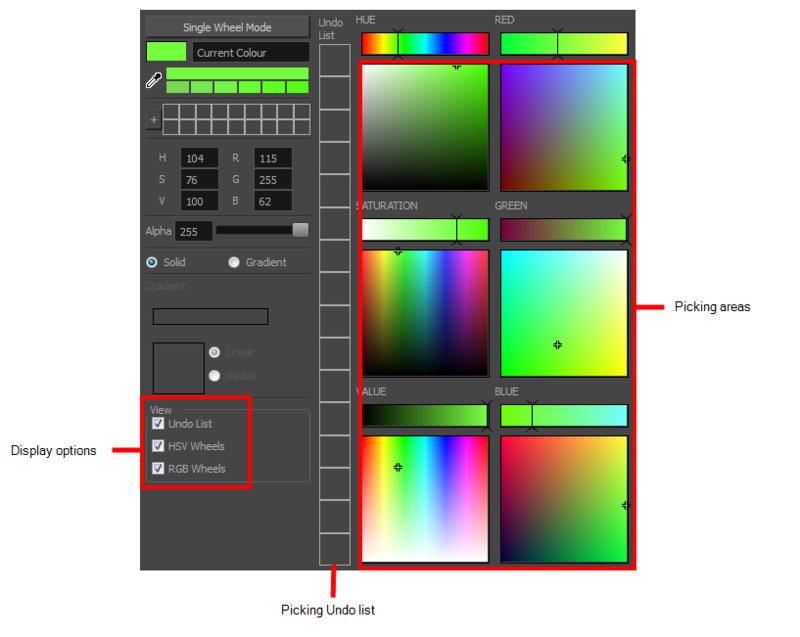 Select the R,G,B or H,S,V options to change the look of the colour picking area. Drag the Dropper to select any colour in the Storyboard Pro interface. NOTE When using the Dropper tool, the selected colour becomes the current colour, but is not added to the colour swatches.